Excellent quadrocopter for the first experience. With him, it's easy to learn how to manage. There are 4 spare screws, but they will not be needed, since there is a good protection that does not damage the screw. To date, this is my favorite store! Always very high-quality service, fast delivery of parcels and instant response to the customer's problems. In general, it is quite satisfactory. The height of the flight needs to be controlled by yourself. It is best not to be too high. About half an hour or so, I have completely mastered the use method. It is not difficult for beginners; The only downside is that the flight time is too short and you need to buy a spare battery. Bough this for my dauther since I have a bigger one . It was easy to get used to . And to learn how to control it . Great Toy Grade Drone! Best Buy! 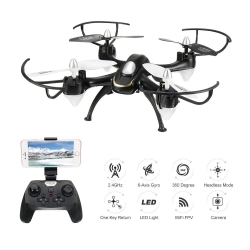 This is the best beginner and toy grade drone. Great for kids and experienced pilots alike! Super stable and fun to fly indoors. Plenty of options to upgrade if you love flying! Get these for everyone as a stocking stuffer for the holidays!